How to export from Bolivia? What are the export registration procedures, export customs process, export cargo movement methods in Bolivia? 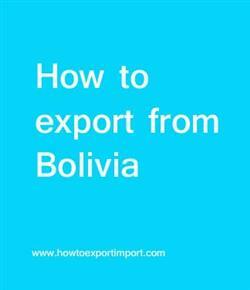 Explain the export methodology in Bolivia. Information given here explains about step by step procedures that need to be finished with Bolivia government authority for exportation from Bolivia. A registered trade with concerned license as per the business is must for exporting and importing of commercial products from and into Bolivia. But according to products nature, certain goods for import may be subject to an authorization, license, rules of quality or packaging, standardization or special formalities. The Bolivian Customs Authority (Aduana Nacional) who is assigned with implementation of all the decrees issued by the country’s ministries and governmental institutions which concerned, collecting duties, controls illegal trade and is facilitator of genuine trade. This post explains about different phases in export process that every exporter needs to go through for completing export from Bolivia. Step by step process to export from. Methods to export from La Paz. Guidelines to export from Santa Cruz de la Sierra. Please guide to export from La Paz. Help to export from Santa Cruz de la Sierra. Procedures required to export from La Paz. Advantages of a SEZ unit. Government benefits in India for a SEZ Unit.